Nicholas Kirkwood "Beya" chunky-woven raffia fabric mule. 0.8" flat heel with high-shine inset. Notched vamp with side stitch details. A Central Saint Martins alum and former associate of Philip Treacy, Nicholas Kirkwood launched his namesake footwear line 2005. The collection instantly earned critical acclaim, receiving accolades and awards for the use of architectural designs and innovative materials. Seeking to fill a gap in the market with statement shoes, Nicholas Kirkwood's quirky but well-crafted designs are anything but forgettable. For in-store inquiries, use sku #2425722. 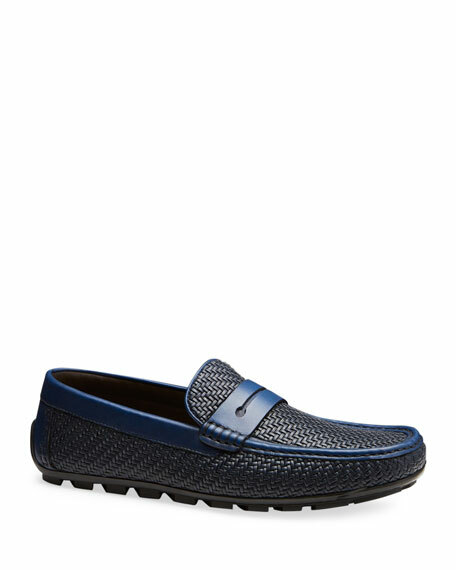 Ermenegildo Zegna loafer in woven calf lather. Apron toe; contrast smooth leather trim. Contrast smooth leather penny keeper. Pebbled rubber driving sole. 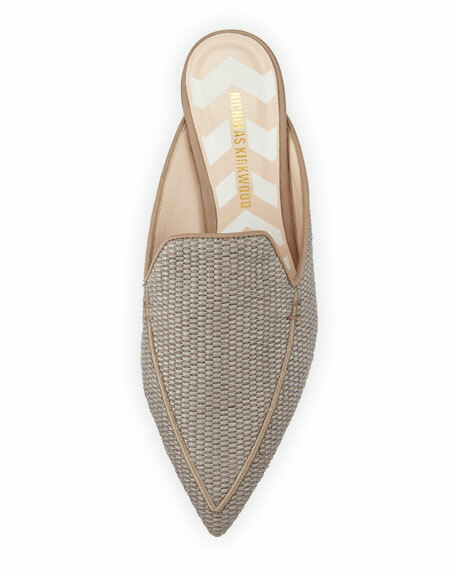 Gianvito Rossi silk satin loafer. 0.8" stacked heel. Round apron toe. Slip-on style. Leather lining. Made in Italy. 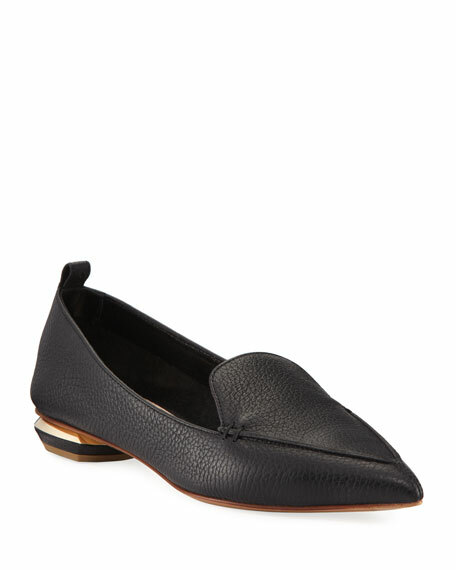 Nicholas Kirkwood leather loafer. 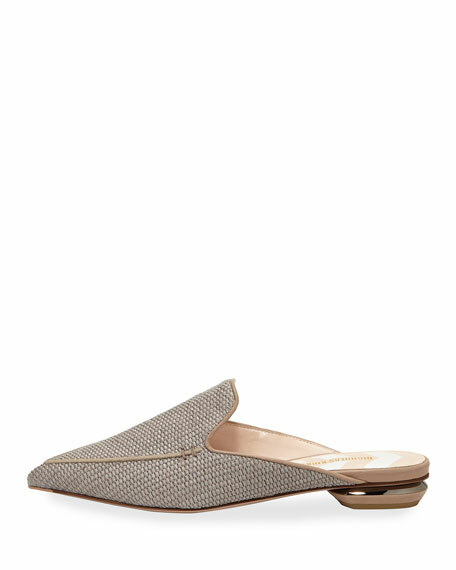 0.8" flat heel with metallic inset. Pointed apron toe. Notched collar. Side stitch details at vamp. Leather lining. "Beya" is made in Italy. 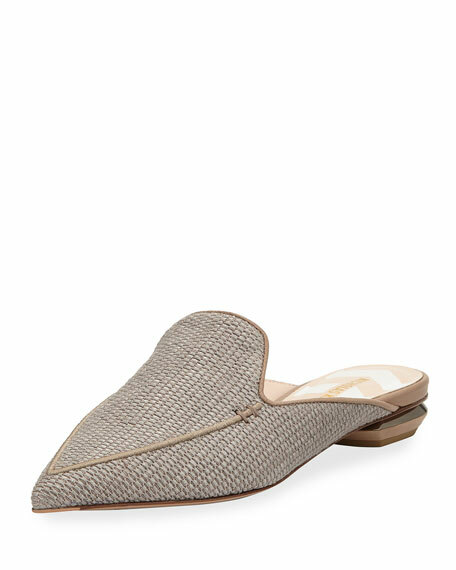 Nicholas Kirkwood pebbled leather loafer. 0.8" metallic flat heel. Pointed apron toe. Side stitch detail. Tab at backstay. Slip-on style.